Handbrake Crashes? Why Handbrake Cannot Rip (Disney) DVD with 99 Titles? DVD creators nowadays develop new copy protection measures out of anti-piracy purpose. As a result, new DVD, especially Disney DVD, usually contains loads of titles, as many as 99, which is responsible for Handbrake 1.0.0 stuck scanning error in DVD main title choosing. In order to fix this Handbrake error, the following solutions will be offered to you if you want to use Handbrake to successfully rip DVD with 99 titles. Take advantages of Handbrake alternative to rip 99-title DVDs to AVI, MP4, MOV, WMV, etc on Mac and Win without error. Play any DVD movies on iPhone iPad Android easily. As mentioned, the key Handbrake failing to rip 99 title DVD is that it is unable to guess the correct one among the 99 title tracks. So the trick to avoid Handbrake crash is to discover the real title from the 99 titles. Generally, it's advised to choose title with the longest run time while ripping copy new movies on DVD with Handbrake. But cases are those title tracks are almost equal overall run times. Don't worry, here is the solution with the help of a DVD player. Step 1: Launch DVD player and play the DVD movie you inserted. Skip through the junk that crops up before the movie. Step 2: While the main feature finally beings playing, move the cursor on the top of display to reveal the menu bar, choose Go -> Title to find the checked title number. This is the title representing the real main feature. Once you keep this title number in mind, you can use Handbrake to rip DVD easily. You can get the step-by-step guide to rip DVD by visiting Handbrake rip DVD tutorial. Tips: On top of DVD player to aid you rip Disney 99 title DVD with Handbrake, you can also find the right title number with the help of VLC media player. Note that to get the 32-bit benefits from HandBrake, you'll need to have a 32-bit version of VLC as well. While for 64-bit Handbrake, you can count on a 64-bit VLC media player. Though sometimes you are lucky to rip 99 title DVDs with Handbrake and its assistant DVD player/VLC player, remember Disney DVD ripping is quite a cat-and-mouse game as the Disney copyright protection tech is updated constantly and gets stronger and stronger. Thus, chances are that you might be able to use Handbrake rip 99-title Disney older DVD with DVD player yesterday, but you would be disappointed with handbrake performance today when decrypting latest Disney DVD 99 titles with new X-project DRM. Honestly speaking, this is a long way for Handbrake to rip protected DVDs, Disney DVDs, Marvel DVDs or Sony DVDs. If you still fail to resolve the Handbrake error in ripping copy protection DVDs, you'd better turn to a professional DVD decrypter yet ripper like MacX DVD Ripper Pro for better results. As a bellwether Mac DVD ripper program, this Handbrake alternative incorporates DVD decrypter, DVD copy and converter software into one, is able to defeat any copy protection schemes such as CSS, Sony ARccOS, Disney new copy protection, etc, copy and rip DVD to MP4, MOV, MPEG, FLV, WMV, AVI, MVK, etc and convert DVD to iPhone, iPad and Android within a few clicks. Below is the simple tutorial to use alternative to Handbrake to rip DVD with 99 titles. Step 1: Free download this best Handbrake alternative and run it on Mac, click "DVD Disc" or "DVD Path" button to import the DVD files. Tips: this Handbrake DVD decrypter replacement will automatically choose the right title for you before DVD ripping process. 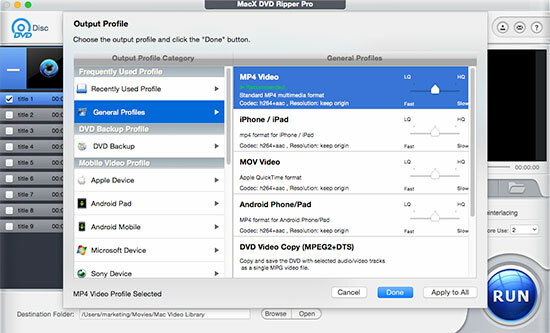 Step 2: Select the DVD movie output format, like DVD to FLV, DVD to iTunes, DVD to iPhone XS, XR, X, iPhone 8, Plus, 7/6S, DVD to iPad Air 2/mini 4 Retina, etc. Step 3: Click "RUN" to start ripping the 99-title Disney DVD on your Mac with DVD ripper for Mac. Truly, in addition to 99 title DVD ripping issue, this DVD ripper also can aid you to solve other Handbrake not working issues. For example, Handbrake can't rip DVD to AVI, Handbrake failed to skip bad sector, no title found, video/audio out-sync, no valid source found, DVD reading error, etc. After finishing the DVD ripping task with this Handbrake alternative, you can apply MacX MediaTrans to transfer the converted DVD contents to iPhone iPad iPod for playback on the move. Besides, this iPhone file manager can also move iPhone photos to Mac/PC or copy music/eBooks from iOS devices to computer and vice versa. Note: The software developer calls for using the Handbrake or Handbrake alternative to rip DVD under the concept of Fair Use and has no intent to encourage any illegal copying. Please comply with the local DVD copyright law before you rip any protected content. Download the best Handbrake alternative for macOS Mojave to cope with the handbrake incompatibility with the latest Mac OS X. Easily rip DVD movies to Mac OS X macOS with alternative to Handbrake. This Handbrake DVD to MP4 tutorial shows you how to freely & easily convert DVD to MP4 on Mac/PC using Handbrake and also shows you the best Handbrake alternative to rip any encrypted new DVDs to MP4, MKV, AVI, FLV, MOV, etc. MacX DVD Ripper Pro, top alternative to Handbrake for Mac to do what Handbrake can't do! Add soft hard subtitle to movie, remove any DVD copyright protections and copy DVDs with 99 titles to ISO image, MP4 MOV dozens of formats original quality.